"Crazy Ex-Girlfriend" was the most widely watched show in Washington in 2016. But it was unseated from the top spot in 2017. Talk about a guilty pleasure: 2017’s most binge-watched show among Washingtonians on Netflix was “Friends from College,” a Netflix original series about the lives of a group of Harvard friends living in New York. To its credit, audiences gave the show a 74 percent approval rating. So tell us, what is it you like about the show? 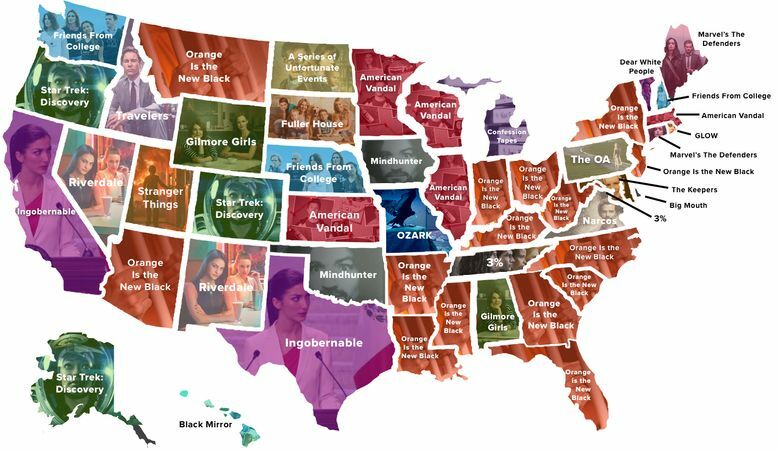 Only Nebraska and New Hampshire like the show as much as we do, according to the data collected by a team at HighSpeedInternet that pored through Google Trends data to find out which Netflix shows were most popular in each state last year. “Our latest report takes us on a nostalgic trip through the past year in online entertainment and reveals a little about each state based on its binge-watching habits,” the company said in a news statement. The new study found that there is not one particular show that has captured the nation’s collective imagination, though “Orange is the New Black” was the single most popular show overall. Last year, it was ABC’s “Scandal,” the study determined. According to the findings for last year, viewers in most states, except Arizona, have found a new show to binge on since 2016.